A friend of mine from seminary asked for some good sites providing resources for Reformed youth ministry. For your and my sake I'm posting what I came up with. Reformed Youth Ministries - I only know it as RUF for high schoolers, but I expect they are good. Their resources page looks good. http://www.ruf.org/ - the mother lode - get their RUF Hymnbook shortcut If not their site, their people are the ones to find. I bet RTS and Covenant Seminary have some resources; I know Covenant Seminary has decided to put all of their course material online for free. Beyond that I might call up the CRC because they had lots of youth material when I was growing up; they can be more theologically liberal than I prefer, though, so like everything you have to be discerning. I've seen a catalog from the Vision Forum, and while they have resources for youth, there's something about their classical education / homeschooling / American Revolution / Christian reconstruction / old fashioned clothes style that seems atavistic to me. There might be some good material there, though. If you want a general theology overview with discussion use, try RC Sproul What is Reformed Theology? Presently our Youth Class uses it. The teacher adapts the study guide material for discussion purposes. Some of the material will be a little advanced, but with guidance it is do-able. The class or youth group setting would watch a 25 min video and then discuss things. If you want a study on the Doctrine of God, His attributes, I have used JI Packer's Knowing God. IVP (Intervaristy) puts out a study guide that goes with the book. Usually students are given a summary of the chapter, I type it up, and then I use the summary as a basis for orienting the class to the doctrinal topic. The study guide helps as a discussion guide. If you want a excellent study on calling, purpose in life, work, giftedness, and servanthood, I recommend the newer book by John Piper. The book is fairly readable, a paperback, and is called, Don't Waste Your Life. There are one or two spots that may be a little advanced, but on the whole it is excellent. One of the editions of the book has a CD with it. On the CD Pastor John Piper speaks to students. He's excellent. The book handles really well God's Lordship in our lives, materialism, wasting your life with run-of-the-mill American Church-i-anity, and so on. His chapter on work, earning a wage, why work, why a job is great. I think there's a study guide with this book too. If you want a study on learing about a worldview and apologietics, you might try the video series called Every Thought Captive. It is a series available from Reformed Seminary in Orlando, FL. It's done by Richard Pratt. I think there are about 8-10 sessions in the whole of the material. I have used the series, a little selectively, and then make use of the 8 1/2 X 11 study guide materials. I photo-copy the sheets. He takes a student through the the basics of why we know what we know, and therefore, why we believe what we believe. A little advanced in places but a good possibility. Again, like the RC Sproul material above, I would show a 20-25 minute video and then stir some discussion with the young people based on the study guide. Pratt has a book by the same title. If you want a good study on Bible texts, biblical culture, and some sound theoogy tied into the Biblical texts try the video series That the World May Know, by Ray Vander Laan. Vander Laan is the well-known Christian school teacher back in Michigan who published about 8-10 years ago a multiple-series of teaching on Bible lands, Bible places, and good engaging lessons on Bible study texts and stories. If you Google in the web That the World May Know, it will come up. Videos, CDs, study guides and discussion material is provided. I have heard of two of OPCs using it. Both have been blessed. Vander Laan teaches at a CRC-based Christian school, at a High School, so he can connect with young people. It may be a little expensive, but check around: maybe a local church has it in their local church library there in San Jose and they'll let you check it out, or have Covenant go ahead and purchase it. Maybe you can buy it in increments. Tim, I have heard it's good stuff. I have never gone through it myself. But on the testimony of others, it's good. I know that some churches are using the Jerry Bridges material: Trusting God, The Joy of the Fear of God, and Transforming Grace----and other books. These all have study guides. These are excellent in grace-based, sanctification issues and Christian growth issues. Again, the leaders would have to provide chapter summaries, and work through the study guides to prepare some discussion sheets. Good stuff. I have used parts of the Bridges material for counseling and studies. I (Tim) note that I've read some reviews of Ray Vanderlaan's teaching which convinced me that he has some strange and sometimes erroneous interpretations of scripture, so I can't recommend his material. On January 20th our country will witness the inauguration of Barack Obama as the 44th president of the United States, and some of you will listen to his inauguration address. What will he say? Likely he will thank those who have helped him, and encourage us to pursue what he believes is a good plan for the future of America and for the world. At the center of the inauguration ceremony he will take the oath of office, in which he will commit himself publicly to serve as our president. For our new president and our nation it will be a high day, full of pomp and circumstance. And if President Obama says the words "So help me God" after his oath, we must pray that God will help him do what is right, and restrain him from doing what is evil. Outline. What happened at the inauguration of Jesus Christ? There is both a great humiliation, and a great exaltation. In vv. 13-15, Jesus submits to God the Father. In vv. 16-17, God the Father approves of His Son. 15 But Jesus answered him, "Let it be so now, for thus it is fitting for us to fulfill all righteousness." Then he consented. Notice here Jesus' purpose to be baptized by John, John's objection to baptizing Jesus, and Jesus' reason for being baptized. Jesus' purpose to be baptized by John is clear. He travels from Galilee to the Jordan, no short distance, specifically to come to John the Baptist, and to be baptized by him. Jesus' purpose is deeper than merely to undergo the outward washing of baptism, however, and His true intent can only be recognized in the significance of John's baptism. John's baptism was an ordinance which God had appointed for all His true followers in Israel to undergo at that time. God sent John the Baptist to call His people to repentance, and to baptize them to symbolize God's washing their sins away. Jesus submitted Himself to God's ordinance. In this you see Jesus' holy submission to God the Father. Here we see the beginning of Christ's public obedience as a man to all the law of God. John the Baptist immediately objects! He tries to put a stop to this madness. "Jesus, how can you ask me to baptize you as if you are a sinner, when I am the sinner?! You are greater than me; I'm not even worthy to untie your sandals, and you want me to call you a wicked sinner? May it never be!" But Jesus says, "Let it be so now." "John, there's a reason why I must be treated as a sinner. I must be treated as a sinner because you are a sinner. I am taking the form of a servant in order to be the servant of all." Jesus says "thus it is fitting." John thought it was not fitting for John to humiliate Jesus Christ, because Jesus was the greater of the two. But Jesus calls John to forget the comparison between the two men for the moment, and remember why Christ came into the world. "Jesus Christ came into the world to save sinners." (1 Tim. 1:15) And to save them, He must be made like them "in every way," be identified with them, and represent them, even bearing the reproach of their sins. It was fitting, Jesus says, "to fulfill all righteousness." Christ was "born under the law to redeem those who were under the law, so that we might receive the adoption as sons." (Gal. 4:4) It was necessary for Christ to obey all of God's requirements, all of God's law, throughout His whole life, in order for Him to serve as our representative before God the Father, in order for God's justice to be satisfied in the Covenant of Works. In the Covenant of Works, the first Adam disobeyed God, but Christ the last Adam obeyed God even unto death on a cross. Now understanding that in this way the Seed of the Woman's heel would be bruised as He crushed the Serpent's head, that it was necessary for the Christ to suffer and then enter into His glory (Luke 24:26), John the Baptist consented and baptized Jesus. In my place condemned He stood—even here in Christ's humiliation is the glory of God's grace. But as God says to you much more He brought about for your Savior--"Humble thyself in the sight of the Lord, and He will lift you up." "Clothe yourselves, all of you, with humility toward one another, for ‘God opposes the proud but gives grace to the humble.' 6 Humble yourselves, therefore, under the mighty hand of God so that at the proper time he may exalt you, 7 casting all your anxieties on him, because he cares for you." (1 Pet. 5:5-7) "20 For what credit is it if, when you sin and are beaten for it, you endure? But if when you do good and suffer for it you endure, this is a gracious thing in the sight of God. 21 For to this you have been called, because Christ also suffered for you, leaving you an example, so that you might follow in his steps. 22 He committed no sin, neither was deceit found in his mouth. 23 When he was reviled, he did not revile in return; when he suffered, he did not threaten, but continued entrusting himself to him who judges justly." (1 Pet. 2:20-22) "Therefore let those who suffer according to God's will entrust their souls to a faithful Creator while doing good." (1 Pet. 4:19) Humbly Jesus entrusted Himself to His Father in heaven, and for that reason God highly exalted Him. Text. We read how God gave His highest approval of Jesus in vv. 16-17, where God the Father approves of His Son. 17 and behold, a voice from heaven said, "This is my beloved Son, with whom I am well pleased." Notice that this passage does not teach baptism by immersion. The Greek does not say Jesus went up "out" of the water, but rather that He went up "from" the water. As such the passage does not teach that He came up from under the surface of the water, but that He came up from the bank of the river. In v. 13 He had come to the edge of the Jordan to be baptized (indicated by the preposition epi), and now having been baptized he comes from the edge of the Jordan (indicated by the preposition apo). Even the word "went up" (anabaino) indicates travel by foot with a horizontal component, rather than rising vertically, which is more commonly indicated by anistemi, "to rise," epairo, "to raise" in one's arms, or anatello, "to move upward" like the motion of the sun or stars. "The heavens were opened to Him"
This great mystery of the Trinity, that there is one God in three Persons, and that those Persons are eternally united to one another in love, is not only worthy of all creation's worship. It is also the source of your salvation. The heavens were opened "to him," to Christ, but they were not opened for only Christ to see. John the Baptist also saw heaven opened and the Holy Spirit descend on Jesus (John 1:32), and so probably the crowds around saw these events as well. These things happened for your sake, so you would know that through Jesus Christ's perfect communion with God the Father a way has been opened for you to be reconciled to God. "Your sin has separated you from God" (Is. 59:2), but through Christ the heavens are now open to you also, so that like the angels on Jacob's ladder you now enter into the Holy of Holies and have access to the throne of grace. "The Spirit of God descending like a dove"
To further demonstrate the infinite and exhaustive unity between Jesus Christ and the other Persons of the Godhead, God the Spirit and God the Father both indicate their full approval of God the Son. Jesus and John, and the others present, "saw the Spirit of God descending like a dove and coming to rest on Him." This should call us to remember the Spirit hovering—like a bird—over the waters at creation. At His inauguration Christ began the work of bringing the new creation to life. Christ who in His divine nature is of one substance with the Holy Spirit, received this endowment of the Spirit in His human nature to set Him apart as a prophet, for all the prophets spoke by the Holy Spirit. He also received the Spirit as the Head of the church, so that the Spirit whom He received, like the oil poured out on Aaron's head ran down to the edges of his robe, Christ would later pour out on the church at Pentecost. He "received gifts for men" (Ps. 68:18) now in order to give "gifts to men" (Eph. 4:8) later. Is. 11:2 had prophesied "the Spirit of the LORD shall rest upon him" to give Him wisdom, understanding, counsel, might, knowledge and the fear of the Lord. At the beginning of His ministry Jesus quoted Is. 61:1, which said the Messiah would say "The Spirit of the Lord God is upon me, because the Lord has anointed me to bring good news to the poor...to bind up the brokenhearted, to proclaim liberty to the captives...to proclaim the year of the Lord's favor." And now the Spirit descended in the form of a dove (cf. Luke 3:22). The Spirit did not appear in the form of a man, for the human form God has reserved for Christ. But a dove is marked by gentleness and innocence. We who are in Christ are to be "innocent as doves" (Matt. 10:16), and the Holy Spirit is Holy. God demonstrated Christ's holiness and innocence by the pure relational harmony, the open communion between Jesus Christ and the Holy Spirit, between the second and the third Persons of the Trinity. "God is light, and in him is no darkness at all." (1 John 1:5) "Every good gift and every perfect gift is from above, coming down from the Father of lights with whom there is no variation or shadow due to change." (James 1:17) Just as a dove brought news to Noah that the flood was receding from the face of the earth, so in Jesus Christ there is peace on earth for men on whom God's favor rests. "11 For I know the plans I have for you, declares the LORD, plans for wholeness and not for evil, to give you a future and a hope. 12 Then you will call upon me and come and pray to me, and I will hear you. 13 You will seek me and find me. When you seek me with all your heart, 14 I will be found by you, declares the LORD, and I will restore your fortunes and gather you from all the nations and all the places where I have driven you, declares the LORD, and I will bring you back to the place from which I sent you into exile." (Jer. 29:11-14) Jesus Christ is the end of the Exile, the end of your life of sin, for you who have faith in Him. Lastly, God the Father spoke in the hearing of all present that "This is my beloved Son, with whom I am well pleased." God's words read this way in the Greek: "My son, the beloved, in whom I am well pleased." You can recognize in these words God's relation, God's affection, and God's satisfaction in Jesus Christ. God declares the relation Jesus has to Him. Jesus is God's Son. He is God's Son from all eternity in His divine nature. He is God's Son in time because He was conceived by the Holy Ghost. And He is God's Son in God's covenant and redemption because He represents us before God as our Redeemer. Notice that God is not only pleased with, but is pleased in His Son. Not just with Christ on the outside, but with Christ on the inside, in His character, and in all those who are found in Him. In that word "in" you should see God's gracious readiness to unite you to His Son in order to also be pleased with you who are found in Christ. And in fact God is pleased not only with Christ, but with you, if you have called out to Him to save you through Christ's death and resurrection. If you have done that, Eph. 1:6 says God has now made you "accepted in the Beloved." He delights in you, because of Christ your Savior. Through Christ who alone is righteous on your behalf, God delights not only your person, but your works, and your worship. Through Christ we now "offer spiritual sacrifices acceptable to God through Jesus Christ." (1 Peter 2:5) Outside Christ "God is a consuming fire" (Heb. 12:29), but in Christ He is your reconciled Father. At Christ's inauguration, Jesus submitted to God the Father, and God the Father approved of His Son. Because Jesus submitted to God the Father, undergoing a baptism of repentance for the remission of sins, in order to represent you before God the Father, you too must repent of your sins! If you have not been baptized, you should follow Him in being baptized! You should follow Him in being willing to humbly suffer in this life on His behalf as you await the day when you will follow Him to glory. Because God the Father approved of His Son, you should also rejoice in His great mercy and grace to you, at His love which He gives to you through Jesus Christ, in calling you now a son of God. If you have any doubt that Jesus is the Son of God, remember why Jesus said, "The Father who sent me has himself borne witness about me." (John 5:37) He said that to remind you, and all people, that God has miraculously, supernaturally, with all authority and power, with all the clarity, necessity, and sufficiency of His own word, declared Jesus Christ to be His Son. There is no good reason to doubt Christ's divinity or Messiahship. There is no good reason to doubt that He is the Savior, the "way, the truth, and the life," without whom no one can come to the Father. At Christ's inauguration He was revealed as your Savior, and your God. "Listen to Him" (Matt. 17:5), love Him, worship and serve Him with all that you are. No earthly king is as gracious, as just, as righteous, as infinite, eternal, and unchangeable, as Jesus Christ, the King of kings, and Lord of lords. Lift up your hearts to give glory to His name. As experience shows, God has sown a seed of religion in all men. As experience shows, God has sown a seed of religion in all people. You can catch up on the gender-inclusive language debate in the comments on Princeton's site. I'm reminded of Richard Muller's excellent book, "The Unaccommodated Calvin," which shows how Calvin's interpreters like to fashion Calvin's meaning according to their own whims, and recommends it's better for your soul if you don't do that. Old school liberal theology is dead in the academy, but it hasn't been replaced by a return to conservative orthodoxy at Princeton. It's been replaced with neo-orthodoxy and varieties of postmodernism, which allow the same practical results as liberalism did: loose views of scripture, Marxist biblical interpretation, social activism, & politics, women in office, approving of homosexuality, etc. 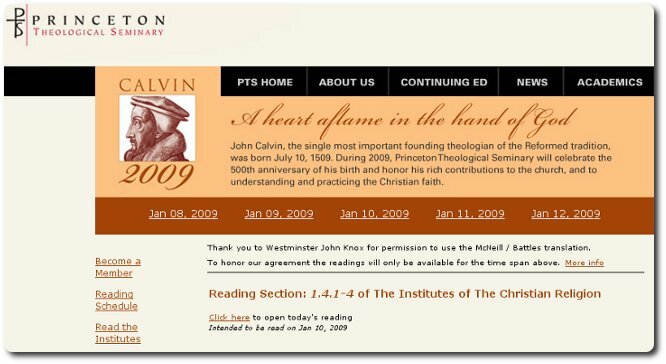 So, in my estimation, Princeton understands its roots in the conservative Reformed tradition and considers itself Reformed, but isn't conservative, so isn't Reformed, at least not in a sense of which Calvin would have approved. So I think it's fine to recommend discerning readers follow the proposed reading schedule, but I wouldn't encourage the average church member to seek spiritual guidance from the plan's organizers at Princeton. 23 and the Scripture was fulfilled that says, "Abraham believed God, and it was counted to him as righteousness"- and he was called a friend of God. V. 20: Who is the "foolish person" to whom James is speaking? See v. 18. V. 21: Paul says Abraham was not justified by works in Rom. 3:20, 28; 4:2; and Gal. 2:16, even using the same proof text found here in v. 23! "The works James commends are not the works Paul condemns." What kind of works do each have in view? V. 22: Works of faith "show" (v. 20) someone's faith, which you cannot directly "see" (vv. 22, 24). What can you "see" about a person's faith in their works? Their faith is a________, and is c_________ by their works. "We are saved by faith alone, but not by a faith that is alone." "Faith, thus receiving and resting on Christ and His righteousness, is the alone instrument of justification; yet is it not alone in the person justified, but is ever accompanied with all other saving graces, and is no dead faith, but worketh by love." What made the prophets of the OT great was not first Moses' position, Elijah's miracles, or Isaiah's message, but rather it was God Himself. Moses' position was to be close to God, Elijah's miracles were God's works, Isaiah's message was the word of God. So why is John the Baptist greater than any prophet of the OT? Because John prepared the way for Jesus Christ. It is not primarily John who is great, but Jesus Christ. In Christ God came near, He worked, He spoke, more than you've ever seen before! Jesus Christ came once, and He will come again. How do you respond to His first coming? How will you respond to His second coming? John the Baptist still tells you today, "Repent, for the kingdom of heaven is at hand." Outline. In the passage before us Matthew shows you true repentance in vv. 1-6, and false repentance in vv. 7-12. True Repentance vv. 1-6 In vv. 1-6 we learn true repentance by observing John's message, John's role, and John's results. True repentance came by means of John's message. 1 In those days John the Baptist came preaching in the wilderness of Judea, 2 "Repent, for the kingdom of heaven is at hand." Kingdom of heaven. Take note of the reason to repent: the kingdom of heaven in its nature and its imminence. John's reason is similar to the reason for Jonah's message in the OT. Jonah said, "Yet forty days, and Nineveh will be overthrown!" (Jon. 3:4) John says "The kingdom of heaven is at hand!" Its nature. What kind of kingdom is "the kingdom of heaven?" It is not an earthly, political kingdom, as Zealots among the Jews thought, and as Dispensationalists think today. Rather, it is a covenantal kingdom—heavenly in its origin, spiritual in its essence, redemptive in its purpose, and earthly in its consequences. God is the Lord of the covenant, and Jesus Christ is Lord. God said "I am a great King" (Mal. 1:14) and Matthew declares from the beginning to the end of his gospel that as the promised Messiah Jesus Christ is the promised King of the Jews; the King of God's people. "The kingdom of heaven is at hand," because Jesus is the King! When the King comes, the kingdom is here. Its imminence. God is coming, so true repentance is the only right response. He is the final judge of all men, who knows all things and from whom there is no escape. But He is not only your judge. He is also your Savior. Christ is the only one who can save you from your sins, and the grace He provides in salvation is abundant and free. Jonah preached only God's judgment with no mention of God's grace,, and to our surprise the people repented. But John preached both God's judgment and His grace. The kingdom God had promised through so many ages, the kingdom when God would once again rule and defend His people, when God would forgive them of their sins and make them holy in their conduct, that kingdom is here! All of God's grace is just around the corner. And if you don't repent, you will miss it. We see John's role in vv. 3-4. John's role was to preach, in order to "prepare the way of the Lord." As such John was a prophet after the pattern of the prophets of the OT. In v. 3 we learn that God foretold John's preaching in Isaiah 40, and in v. 4 John's clothes and food illustrate his similarity to the OT prophets. 3 For this is he who was spoken of by the prophet Isaiah when he said, "The voice of one crying in the wilderness: Prepare the way of the Lord; make his paths straight." 4 Now John wore a garment of camel's hair and a leather belt around his waist, and his food was locusts and wild honey. The foolishness of preaching. You should recognize in John what Paul calls the foolishness of preaching. You can see it in John's food and clothing. John wore the clothes and ate the food of a man living off the land. To those in the city John is a mountain man, a bohemian, and he should remind you of the outlandish things God called His prophets in the OT to do to get His people's attention. Elijah "wore a garment of hair, with a belt of leather about his waist" (2 Kings 1:8), called down fire from heaven, parted the water with his cloak, and in his cloak Elisha healed a leper and raised the dead. Jeremiah bought a field during a siege, Ezekiel made a model of Jerusalem under siege, laid on his side for forty days, shaved his head and burned his hair, packed his bags for exile and dug through the wall of his house for all to see, set up signs pointing the king of Babylon to Jerusalem. John's striking clothing marks him as a prophet like Elijah, Jeremiah, and Ezekiel. But John did not perform signs and miracles. John preached. Like the foolishness of the signs performed by the prophets, God used John through the foolishness of preaching. John was the son of a priest and so was a priest himself. Shouldn't he be performing sacrifices in the temple in Jerusalem? But here he is in the wilderness, among country folk, crying out to them a message you wouldn't believe. "God is coming, and He will travel through here. Get ready; He's coming!" And the people would ask, "Why here? Why now?" No man will know the day or the hour; He will come like a thief in the night. John preached not because he was a wise man, but because God told John God was coming. Noah built a boat in the middle of the country side with no rain in sight, and the people said "You're crazy, Noah!" Moses went to the most powerful man in the world and said, "Let my people go." "You're crazy, Moses." Jonah said "Yet forty days and Nineveh will be destroyed." "You're crazy, Jonah." But God has spoken, and he will bring it to pass. In Malachi 3:1 God said "Behold, I send my messenger and he will prepare the way before me. And the Lord whom you seek will suddenly come to his temple; and the messenger of the covenant in whom you delight, behold, he is coming, says the LORD of hosts." The necessity of preaching. You should also recognize in John the necessity of preaching. You will not repent unless God tells you to do so. John's Results: True Repentance vv. 5-6. In vv. 5-6 we see the results of John's preaching—God brought His people to true repentance. John performed no outward miracles like Elijah, but through him God began a spiritual miracle greater than any He had done before—the spiritual restoration of His people to Himself. False Repentance vv. 7-12. In vv. 7-12 God warns us against the false repentance of the Pharisees and the Sadducees. The Pharisees believed God's word to a "T," and even added to God's word by adding laws to guarantee they wouldn't come close to breaking God's law. They were legalists—all law and no grace. The Sadducees were looser in their interpretation of scripture, and didn't believe in miracles or the resurrection. They were liberal theologians—fake grace and no law. And these Pharisees and Sadducees want John to baptize them. 7 But when he saw many of the Pharisees and Sadducees coming for baptism, he said to them, "You brood of vipers! Who warned you to flee from the wrath to come? Bear fruit in keeping with repentance. John warns us against three evils of false repentance. First, he says bear fruit in keeping with repentance. Fruit. The fruit of good works is the outflow and so the evidence of true repentance. The Pharisees and Sadducees claimed to be heeding God's word and repenting of their sin. But they did not actually repent, which was plain in the fact that they did not confess their sins, and they had no fruit of good works. When you repent, you change your mind, but that must also make you change your ways. "Who warned you?" John asks them "Who warned you?" Was it Satan or God? Who are you listening to? If you knew it was God who commands you to repent, you would do it. But you don't listen to God. Who do you listen to? "Flee from the wrath to come" John says the Pharisees and Sadducees are "flee[ing] from the wrath to come." Just like snakes hiding in a brush pile flee from the flames when it is set on fire, so false repentance flees the pain of God's judgment but not the evil of one's own sin. Do you flee from your sin to God your Savior, or do you flee from God's wrath to find comfort in a different sin? "Bear fruit in keeping with repentance." 9 And do not presume to say to yourselves, 'We have Abraham as our father,' for I tell you, God is able from these stones to raise up children for Abraham. When you repent of your sins, don't claim to be righteous, but confess your sins. The Power of Jesus Christ. Last, John tells you of the power of Jesus Christ. False repentance doesn't stand a chance against the wrath of Jesus Christ. 11 I baptize you with water for repentance, but he who is coming after me is mightier than I, whose sandals I am not worthy to carry. He will baptize you with the Holy Spirit and with fire. 12 His winnowing fork is in his hand, and he will clear his threshing floor and gather his wheat into the barn, but the chaff he will burn with unquenchable fire. The trees that do not bear fruit are unbelievers, and the fire into which they will be thrown is the everlasting conscious torment of the fire of Hell. And because Jesus has come you are already on the way there. The axe is laid to the root of your tree. Will Jesus take you to be His own, or will He cast you away? Today is the day of salvation. The time to repent is now.